For those of us who knit, it will come as no surprise that knitting can be used as a therapeutic practice. A therapeutic process is one that heals our minds, bodies, spirits, or some combination thereof. 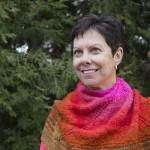 Knitters will recognize that healing – in the joy we derive from most of our knitting experiences. Whether you are planning a project, fondling yarn, selecting just the right materials from your stash, or actually knitting, many steps of the knitting process bring about a sense of contentment and well-being. After all, that’s part of why we do it, right? Knitting can produce a host of benefits: creative inspiration, senses of accomplishment and self-confidence, community building, and the rhythm of a relaxing activity, to name a few. However, more depth is possible; adding the concept of mindfulness can enrich the experience of knitting and promote peace, contentment, and healing. Mindfulness is about paying attention to what is right with you, some of which you might normally take for granted or ignore. By paying attention in a new, more loving, and systematic way to what is right with you, you can discover a new capacity for understanding and growth. Mindfulness is well-researched and well-known to promote physical and emotional health. Techniques such as mindfulness meditation are widely used in treating cancer patients, anxiety, depression, and many other physical and emotional illnesses. The most basic explanation for how mindfulness practice fosters good health is that it lowers stress and helps with pain management, which helps the body and mind to heal. 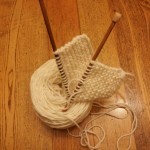 I’m offering a course on 3 essential aspects of mindful knitting for a few reasons. The first reason is because I think that combining mindfulness with a hobby that you love will encourage you to practice mindfulness more often – whenever you pick up your knitting needles. And it is the frequency of practicing mindfulness that ultimately provides the greatest benefit. The second reason is because the standard way that mindfulness is taught is in an eight week program – and that is a huge time commitment that many people do not wish to make. So this course is intended to distill some of the essentials of mindfulness into a 3 part course taking place over a one month period. Enhancing your Awareness – deals with focusing on your skills of observation and awareness. Here you learn how to practice that focus again and again. Dealing with Difficult Emotions – our natural tendencies are to ignore or repress unpleasant and difficult emotions. Here you learn how to approach and accept difficult emotions and thoughts – being curious about them. This can often lessen your fear of them. Self – Compassion – our tendency to be critical of ourselves is harmful yet persistent. Here we learn about enfolding ourselves in loving kindness.